We address the problem of model checking hybrid systems which exhibit nontrivial discrete behavior and thus cannot be treated by considering the discrete states one by one, as most currently available verification tools do. Our procedure relies on a deep integration of several techniques and tools. An extension of AND-Inverter-Graphs (AIGs) with first-order constraints serves as a compact representation format for sets of configurations which are composed of continuous regions and discrete states. Boolean reasoning on the AIGs is complemented by first-order reasoning in various forms and on various levels. These include implication checks for simple constraints, test vector generation for fast inequality checks of boolean combinations of constraints, and an exact subsumption check for representations of two configurations. These techniques are integrated within a model checker for universal CTL. Technically, it deals with discrete-time hybrid systems with linear differentials. The paper presents the approach, its prototype implementation, and first experimental data. 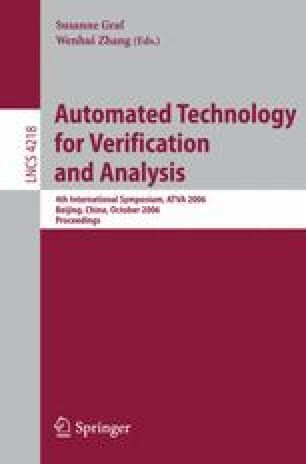 This work was partly supported by the German Research Council (DFG) as part of the Transregional Collaborative Research Center “Automatic Verification and Analysis of Complex Systems” (SFB/TR 14 AVACS, http://www.avacs.org/).